Want to Write at Fan4Racing? Sergio Pena at 9 pm ET on Thursday, April 28, 2016. Sergio Pena is our guest on Fan4Racing NASCAR Weekend Preview on Thursday, April 28, 2016 at 9 pm ET. Call 929-477-1790 or tweet @Fan4RacingSite or @beberly18 with any questions or comments during our LIVE broadcast. NASCAR K&N Pro Series East teams return to VIRginia International Raceway this weekend for the Biscuitville 125 with some road course racing that will add some interest to their championship point standings. Intending to defend his victory last August with Rev Racing at the 17-turn, 2.250-mile track is Sergio Pena, this year with Sam Hunt Racing and making his K&N East 2016 season debut. In three K&N East races at VIR, there have been three different winners and NASCAR Next Alum, Pena wants to become the first to earn a repeat victory at what he considers his home track. From Winchester, Virginia, 23-year-old Pena is one of two drivers calling Virginia their home state – the other driver is Brian Henderson. 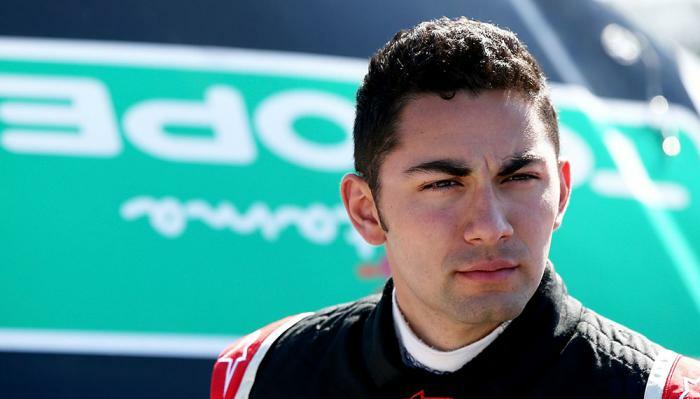 In Pena’s two starts at VIR, he finished fourth in 2014 and first in August of 2015. In 59 series starts, Pena has earned five wins, ten top-fives and 28 top-tens and will be a formidable contender this weekend. The first two winners at VIR were Dylan Kwasniewski in 2013 and Scott Heckert in 2014 with both winning from the pole in Chevrolets. Showing the road course can produce a winner from the back as well, Pena started from 13th in 2015 and didn’t take the lead until the last lap of the race in his Toyota. Furthermore, three of the top-four finishers started among the last five cars in the field. Other drivers, looking to win this weekend include series points leader and NASCAR Next driver, Kyle Benjamin, who was not originally scheduled to race at VIR this weekend. However, his team decided it was necessary to race the Biscuitville 125 so they could defend his points lead and continue their strong start of the season. Although Benjamin has 22 series starts, his has limited road course experience with just one race at Watkins Glen, where he finished in 14th-place. Second-place, Justin Haley is just three points behind Benjamin and nine-points ahead of his teammate at Rainier Racing with MDM, Spencer Davis. Haley, who turns 17 today, led six laps last year before finishing fifth and Davis is making his first series road course start this weekend. If either of them struggle this weekend, their teammate Tyler Dippel is in position to move up the point standings with veteran drivers, Kaz Grala and Ronnie Bassett Jr, also looking to make their experience pay big dividends this weekend. Will VIR produce another different winner this weekend? Will the series point standings see a shake up after the Biscuitville 125? Can Sergio Pena make history by becoming the first to earn a repeat win at VIR? The answers will come this weekend. Practice is from 9:30 to 11 am ET with Qualifying at 1 pm ET. on Saturday, April 30th. The Biscuitville 125 will begin at 3:45 pm ET with live timing and scoring along with race updates available at Race Central powered by Speed 51 at the NASCAR Hometracks website. NBC Sports Network will offer a delayed broadcast of the race – check your local listings for the date and time. This entry was posted in Fan4Racing, K&N Pro Series, NASCAR, Track News and tagged Biscuitville 125, Dylan Kwasniewski, Justin Haley, K&N Pro Series, Kaz Grala, Kyle Benjamin, NASCAR, NASCAR Next, Rainier Racing with MDM, Rev Racing, Ronnie Bassett Jr, Sam Hunt Racing, Scott Heckert, Sergio Pena, Spencer Davis, Tyler Dippel, Virginia International Raceway by Fan4Racing. Bookmark the permalink.